SKY MAP: Jan. 26 at 9 p.m. local time from mid-northern latitudes. According to a legend, more than two centuries ago, a famous Paris astronomer used to stand on one of the Seine bridges on nights when the variable star Algol was in eclipse, to point out this remarkable phenomenon to passersby. Today, more than 25,000 Algol minima later, the periodic brightness changes of this star remains a fascinating sight to the amateur who knows when to look and what to look for. Algol, in the constellation of Perseus, the Hero, was known since ancient times as "The Demon Star" and is one of the most famous variable stars in the sky. Its name seems to suggest that the medieval Arabs were aware of its marked changes in brightness. In 1782, amateur astronomer John Goodricke (1764-1786) realized that this star was really a pair of stars orbiting a common center of gravity and that when the dimmer of the two crossed in front of the other, the light from Algol appeared to fade. Because the entire eclipse takes 9 hours and 40 minutes from start to finish, the entire performance can be seen in a single night when the timing is right. This stellar eclipse occurs like clockwork at intervals of 68 hours, 48 minutes and 56 seconds. Normally, Algol appears 3.3 times brighter than during the peak of the eclipse; it usually shines at magnitude 2.1, about equal to the star Almach (Gamma Andromedae), but when it's at minimum light, it fades to about magnitude 3.3, or about equal to Alpha Trianguli. While diminished light lasts nearly 10 hours, the eclipse begins and ends so gradually that most of the fading and subsequent brightening takes place within the two hours before and two hours after mid-eclipse. 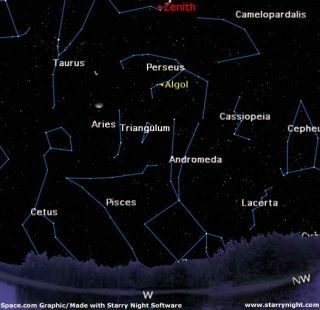 This week, Algol can be found almost directly overhead as darkness falls. It spends the rest of the night, slowly descending down into the northwest sky, and will be quite low to the horizon by around 2 or 3 a.m. The table below, gives the dates and local times for the next six eclipses that can be observed from parts of North America. When an asterisk (*) is used, it means that the eclipse will occur not on the date listed, but on the previous calendar day. "N.O." stands for "Not Observable," since the eclipse takes place too near to sunset and the sky will simply be too bright to see the star. Two hours before the predicted minimum start checking Algol's brightness. If you are observing casually, a look every half hour is sufficient; if you are trying to determine the time of mid-eclipse, 10-minute intervals are better. Algol is at minimum light for about 20 minutes - as the large, dim star passes across the smaller, brighter one - then it gradually returns to normal.